PowerChair footballers hope to ‘Make Pudsey Proud’ this weekend when the latest leg of the innovative new format takes place at Riverside Ice & Leisure Centre in Chelmsford under the guidance of the Essex County FA’s John Manning. Following a successful launch event in October, interest has continued to grow in PowerChair football since the Association linked-up with Leigh Ramblers FC and BBC Children in Need to provide for a gap in the market. This month’s event is just around the corner and Manning envisages a decent turnout after the break for Christmas and New Year. For many, PowerChair is the only truly inclusive active team sport, catering for, and being open to, people who use a wheelchair (either electric or manual) or those who have severe mobility impairments. The Wheelchair Football Association state that, although the origins of mainstream football are “jumpers for goalposts,” PowerChair is more complicated. But funding from Pudsey has led to a programme being put in place for the next three years and beyond. 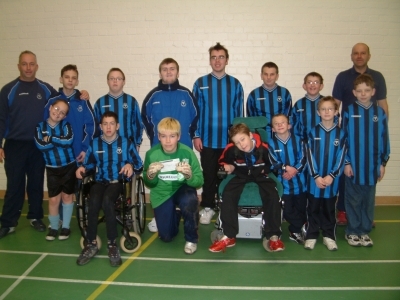 The costs of setting-up a team meant this format wasn’t accessible until Leigh Ramblers FC evidenced the need for PowerChair football and expressed an interest in offering the provision, but they couldn’t generate the finances required on their own until a successful application was made for Children in Need funding. It was then showcased at a launch event last year led by Sam Bull, the National Football Development Manager for the Wheelchair FA. Now equality and inclusion campaign ‘Kick It Out’ are also keen to promote this initiative as an example of good practice. Along with the new publicity, this year will also see a schools programme covering the whole geographical area of Essex that will support this provision as well as coaching and referee courses which will soon be announced. Would you like to get involved? Sessions take place once a month on Saturdays at the Riverside Ice & Leisure Centre, Victoria Road, Chelmsford, CM1 1FG. They’re open to all ages, genders and abilities and run from 10:00am to 1:00pm. For details, visit www.essexfa.com, contact John Manning on (01245) 393095 or E-Mail john.manning@essexfa.com. You can also see video clips at http://www.youtube.com/ by searching for ‘Essex PC’. Essex wheelchair users with a passion for football now have a pathway to potential Champions League glory thanks to the new PowerChair Football sessions being staged by the Essex County FA at Riverside Ice & Leisure Centre in Chelmsford, with Senior Development Officer John Manning claiming: “The world is your oyster!” Saturday 13th November sees the second instalment of the development plan rolled out from 10:00am to 1:00pm at the Victoria Road venue and Manning, who sustains a role in the inclusion department within the County’s governing body, is inviting new blood to join the ranks locally and rub shoulders with renowned Watford-based players from Evergreen PowerChair FC. For many, PowerChair football is seen as the only active team participation sport which is fully inclusive, catering for, and being open to, people who use a wheelchair (either electric or manual) or those who have severe mobility impairments. Vital to the success of this programme has been support from the Wheelchair Football Association and BBC Children In Need funding, plus the provision of an exit route from FA Charter Standard Community Club Leigh Ramblers FC. Little is known about the structures available, but the Essex sessions provide an opportunity to play in a regional competition planned for 2011/12 then a National League in the final year of the programme’s funding. The potential journey could then continue, as the Country’s top clubs play in a European Champions League while England have one of the leading teams in the world participating in the 2011 World Cup and, pending a decision, the 2016 Paralympics in Brazil. Since receiving funding from Children In Need over the summer, John has worked tirelessly to purchase equipment and construct the three-year development plan in order to ensure its long-term sustainability. Having secured three years’ worth of funding, the programme’s development plan will see sessions being delivered centrally in Chelmsford for the first two years before, in the final year, a transition of provision from the Essex County FA over to Leigh Ramblers. The club have a proven track record of providing disability football to their community and they identified the need to better include those who used a wheelchair. 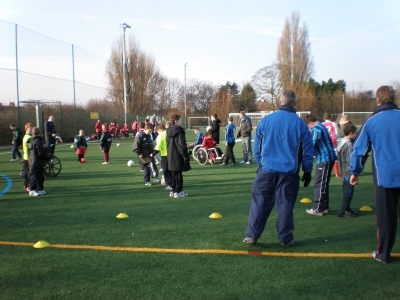 Upon seeing a demonstration they embarked on a commitment, along with the Essex County FA, to ensure PowerChairs would eventually become part of Ramblers’ overall service to Southend and wider Essex. 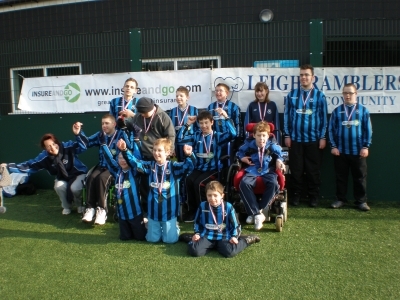 Leigh Ramblers are the latest club in Essex to offer football for all with regular Soccability coaching sessions for children with disabilities. The Southend based Charter Standard outfit recently completed an eight week Three Lions pilot programme for the children and Leigh Ramblers coach, Graham Owen, is delighted with the progress they’ve made: “We originally started up with just four boys but we’ve got ten in total now and it’s been great fun,” said Graham who recently completed a Coaching Disabled Footballers course with the Essex County FA. Graham admits that the one hour sessions for 8-16 year olds on Saturday mornings are a lot different from his regular coaching with Leigh Ramblers’ youth teams: “We didn’t know what to expect at first but it’s just a case of tailoring the skills and drills to the strengths of specific individuals. Leigh Ramblers’ neighbours, Hambro Colts, have been pushing Soccability in the south of the county and Graham went along to a couple of their coaching sessions before starting up the Ramblers Three Lions club. “Bob Pointer has done a great job at Hambro Colts and it gave us an idea on how to approach the coaching sessions at Leigh Ramblers. We also attended their recent Soccability festival which everyone enjoyed,” said Graham who has coached at Leigh Ramblers for over five years. Graham added: “Bob is keen to start up a friendly football league for all the local Soccability clubs and we’d love to be involved.